Detta är ett zoom-objektiv som tillverkats av Tamron och modellen lanserades 2005. Objektivet har en brännvidd på 18-200 mm. Eftersom objektivet är konstruerat för att användas på en kamera med mindre sensor ('APS-C') kommer brännvidden att uppfattas som och motsvara 29-320 mm om du har en Canon-kamera eller 27-300 mm om du har en Nikon-kamera. En sak att tänka på är att objektivet har en föränderlig ljusstyrka, vilket innebär att beroende på hur mycket du har zoomat in så kan objektivet ha mer eller mindre bra ljusstyrka. Vid 18 mm har objektivet ljusstyrkan f/3,5 och vid 200 mm är ljusstyrkan f/6,3. Via länken nedan kan du läsa mer kring vad detta kan innebära för dig som fotograf. Om du köper detta objektiv följer det med ett motljusskydd, vars modellbeteckning är "AD06". 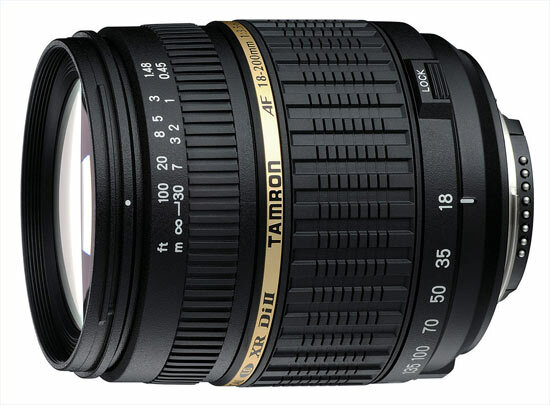 Text från Tamron: "The 18-200mm F/3.5-6.3 XR Di-II blends optical performance, convenience and versatility in the world´s lightest, most compact 11.1x zoom for digital SLR cameras. Precision optics and a collection of Tamron technologies work in concert to deliver outstanding image clarity, and the freedom of wide-angle-to telephoto shooting with just one lens. Fewer lens changes means your DSLR´s image sensor is exposed to picture-degrading dust less often, safeguarding consistent image quality. Streetscapes and confined interiors come to life at 18mm. Far away subjects are reined in easily at 200mm, which is made even more powerful by the inherent crop factor of APS-C-sensor DSLRs—a benefit that causes magnification equivalent to a 310mm lens on a full frame (36mm x 24mm) digital or 35mm film SLR. Of course, every focal length in between offers the continuous framing control to apply personal preference to every shot. Due to its very big focal length range this 18-200mm is suited as a standard lens for practically all photographic situations. Especially when travelling, its ultra-compact and light construction offers perfect photo fun. From wide-angle to telephoto- you can master many photographic situations with this lens. The18-200mm Di II lens stands in the tradition of the legendary range of Tamron mega zooms and has a 11.1times zoom corresponding to an equivalent of 28-300mm when compared to full frame cameras. The18-200mm Di II works with innovative XR glass (extra Refractive index) to optimize the optical performance in the whole focal length range. This design reduces several aberrations to an absolute minimum and at the same time ensures a more compact construction. Moreover, three aspherical hybrid elements are used to avoid spherical aberration as well as two LD (Low dispersion) glass elements to compensate for chromatic aberration. The result is a versatile zoom lens with outstanding optical quality. It reaches a magnification ratio of 1:3,7 and, hence, is suited also for macro shots, with a minimum focus distance of only 45 cm. Experience the versatility of this lens which sets a new norm in standard lens coupled with a fantastic price performance ratio. Please note: The 18-200mm became available with a built-in motor for the Nikon D40, D40X and D60 (Model A14NII) from March 2008. The A14N model which had been available up until March 2008 is only compatible with the D40/D40X/D60 in the MF mode due to the fact it doesn´t have a built-in motor. "